G’day APJ family. Really great to have you here! I have been to a few perfume meet-ups now and I have been able to hear other like minded folk talk about perfumery and scent. 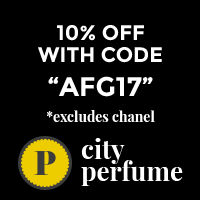 It has been brilliant to learn how you all feel about, discuss and approach perfume. But what has become very obvious to me is how differently I process, not just my emotions regarding scent, but the pleasure, and pain, I get from smelling things. Our summer is pretty much over, and as short as it had been, I found it one of my best summers yet. I discovered a wide range of hot weather loving scents that are not the usual citrus, cologne style or 90s breezy, aquatics. Needless to say, Chloe Nomade got a lot of wear, as did 34 Boulevard St Germain by Diptyque. Ever have one of those moments when you suddenly become aware of falling head over heels for something, or someone, that really makes no sense? Maybe it is that weird tasting cereal that has ingredients that you usually despise, or that little weekend hideaway in the hills you keep returning to that is far from your beloved beach. I fell in love with Chloe Nomade. It was only because I was repeatedly typing into in my Facebook perfume group as my Scent of the Day that it dawned on me how often I was wearing it. The glorious Drew bag shaped bottle gives nothing away of how much I have used. It has snuck into my top five list of most loved and is first for most worn. My very dear friend, Karen, recommended Nomade a year ago. I eventually tried the scent on a card and found it unimpressive. I loved the bottle and the laid back advertising, but the scent underwhelmed me. I am not sure what prompted me to buy a 50ml bottle at the tail end of winter other than a Fragrantica review of it had me return for a closer smell. Freesia caught my eye and I realised I had not tried it on my skin. We all have those unsung hero type scents that sit mid way on the shelf, rarely used. For a myriad of reasons, the scent keeps getting over looked. I see it and think, ‘Yeah, another day perhaps; not in the mood for it now.’ I even forget why I was attracted to the scent in the first place. This morning I picked this hero up and sprayed.